I have my own theory about why the decline happens at companies like IBM or Microsoft. The company does a great job, innovates and becomes a monopoly or close to it in some field, and then the quality of the product becomes less important. The product starts valuing the great salesmen, because they’re the ones who can move the needle on revenues, not the product engineers and designers. So the salespeople end up running the company. For many well-known companies it’s all about market share. For Apple it’s all about added value not only from an operational point of view. Apple as the most prominent tech giant proofs that top designed products (as seen from inside and outside) increase desirability and desirability always goes along with profitability. Engineers have to focus on both, hardware and software, and keep these components harmonized. Salespeople should just support the company’s vision with sophisticated spots, without hammering specs into the heads of people. A bunch of loyal customers will be the reward. 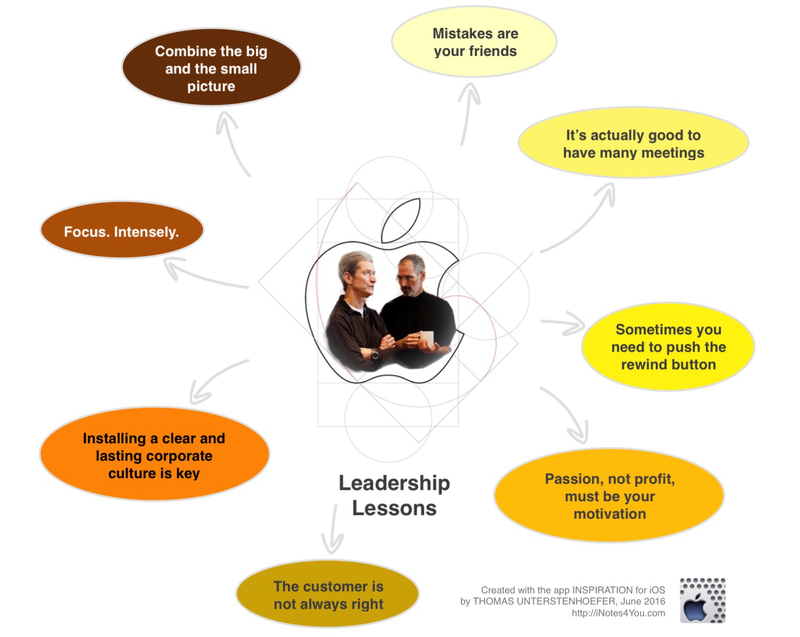 Have a look at my mind map to learn more about Steve’s business philosophy which in my opinion coincides with that of Tim Cook. Isaacson enjoyed unprecedented access to Steve Jobs, drawing on over forty exclusive interviews with the tech icon.